A scan had been performed on the ewe, which is a Romney breed, and showed that the mother could expect four lambs. "That's what we were expecting because the scanner had been 100% right up to that point," said Witherow's son Andrew. "She'd lambed the first one herself and because there were four you do expect them to be quite small. "They can come out very quickly and still have the membrane around them so there's a risk of suffocation." Often during birthing, lambs are taken from the ewe by hand to avoid such complications. 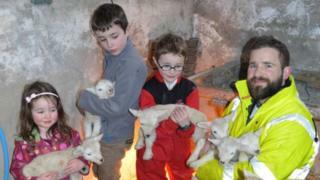 "Dad assisted her and took the lambs from her, the second the third and the fourth," Andrew said. "We looked at them and they were so small we thought, lets just check again to see if there was anything else. "So he (Witherow) put his hand in to double check and pulled out another one, then he thought I'm going to check again and he went in and pulled out the sixth!" The Shannons are now hand feeding the lambs milk but most of the caring is done by their mother. "Because they are still so small they don't really need that much, maybe a bottle of milk twice a day divided between them," said Andrew. "Maybe in the next day or two we'll maybe take three of her and leave three with her." Laughing, Andrew Shannon told BBC Radio Foyle they were not the only ones left astonished by the sextuplets. "The Romneys are very good mothers so she's looking after them all but we think she must be a little surprised herself," he said.